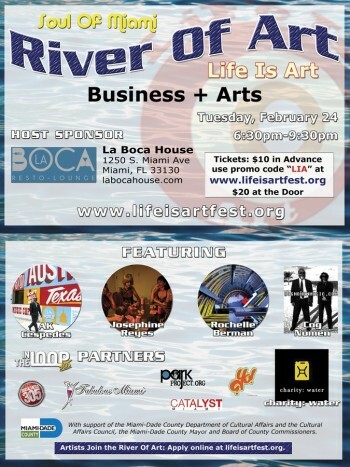 Life Is Art & Soul Of Miami kick off the 2015 River Of Art networking arts series with an exciting evening of business networking featuring a beautiful photography show and live music hosted at the beautiful new La Boca House in Brickell. Parking: Street spaces, parking lots at 11th St. & Brickell Ave., 9th St. & SW 1st Ave. The River Of Art is a monthly gathering place of Miamiâ€™s good people, executives, industrialists, innovators, creators, entrepreneurs, changemakers, activists, and artists. Each month, Life Is Art brings the community together at our River Of Art pop-up art-in-public-places show to socialize through the power of the arts with the goal of exposing new artists, introducing new people to art appreciation, providing an inspiring space to make new connections, showcasing local businesses and charities, while providing a fun break during the work week. La Boca House is providing a special welcome drink and light cuisine tastings. Art is an inspiring talking point, discussing it is a great way to break the ice. Culture is one of the primary elements that build community and hosting a business networker within an art show is a unique way to encourage socializing, so be sure to bring plenty of business cards and an open mind! With support of the Miami-Dade County Department of Cultural Affairs and the Cultural Affairs Council, the Miami-Dade County Mayor and Board of County Commissioners. TICKETS – Remember to use your promotional code! Cog Nomen is a band from Miami featuring guitarist, Buffalo Brown and drummer, Brave Ulysses. The sound is electro-pop with an good dose of ambient rock-scapes. Rochelle’ simple dynamic photographic compositions are emotional, colorful, spiritual, and impressionistic. The artist was born in Brooklyn, NY and currently lives in Miami, Florida. She spent her youth studying the visual arts, life drawing classes in Soho studios as a teen. She always loved to draw, paint and write poetry but it was in college that she finally discovered that her greatest passion of all was Photography. Rochelle especially enjoys creating experimental portraits, nature studies and travel related Images. ak cespedes was born in Lima, Peru in 1975 to parents who loved to travel. Her early life was all about documenting family life via photos. These two familial passions, since instillation, have become a passion of hers that continues to feed her need to explore and grow as an artist and an individual. In 2013, she quit her full time job as a TV Production Manager and embarked on a European summer vacation, spending the first month in Italy, eventually meeting up with her parents to end the adventure touring Germany, Austria, Czech Republic and Hungary. Currently, ak is creating a multimedia line of work incorporating photography and woodblocks which will be featured at various art venues throughout South Florida. I have developed a passion for creating conceptual/narrative and documentary images. I love taking my visions or interpretations and expressing them through photography, transforming them into a reality. Exploring my ideas through the cameras lens, Iâ€™m able to capture a fascinating visual that will take my viewers to a new place and into the world of others. charity: water is a non-profit organization bringing clean and safe drinking water to people in developing nations. Most of us have never really been thirsty. We’ve never had to leave our houses and walk five miles to fetch water. We simply turn on the tap, and water comes out. Clean. Yet there are 748 million people on the planet who don’t have clean water. LBH is Brickellâ€™s friendly neighborhood resto-lounge with simply good food, signature drink list created by mixologist Nick Nistico. La Boca House Nicknamed LBH is an establishment that was created for locals to unwind and dine and feel right at home. Itâ€™s open for lunch, dinner, and brunch on the weekend. The River Of Art is a monthly business networker and art showcase combined. We provide more than just a platform for professionals to get together, discuss business strategies and make connections, we create synergies to help promote business by including an amazing art show of local talent! The Soul Of Miami has become one of the most popular local community sites in south Florida. It includes an extensive calendar, listing all sorts of happenings from all over the area: charity, arts, happy hours, concerts, networkers, nightlife, fairs, festivals and so much more. Tens of thousands of active south Floridians visiting the site every month.